As simple as it may seem, coffee quality increases when farmers drink their own black coffee. Problem is, its cultural in Laos to drink green tea and those who do consume coffee usually drink 3-in-1 instant coffee, which is full of additives, creamer and sugar. By separating out each nano-lot, sample roasting it and allowing JCFC members to cup their own coffees, they’ve begun to understand that not everyone’s coffee is the same but in fact they are quite different, which was the long-standing belief. Filanthrope & Jhai Coffee House conduct pre, mid, & post harvest season cuppings with all JCFC villages. Nano-lots and varietals are always kept separate so that shining stars are located! Additionally, by putting different origins on the table, farmers have begun to see that they are not just competitors with their their neighbor villages but have come to the realization that, collectively, the JCFC makes up the origin of Laos and they are actually competing with the Ethiopians, Kenyans and other coffee origins of the world. Friendly cup competitions have undeniably raised coffee quality year after year but have also achieved a level of camaraderie among the leadership who have become more invested in sharing knowledge and helping each other to achieve producing the best quality they possibly can. Just four years ago, only a handful of JCFC coffees barely broke 82 points; these same coffees are now cupping 87+ points and are incredibly clean and beautiful. At the beginning of the 2016/17 season, Jhai Coffee House and Filanthrope worked with the JCFC management to create a cooperative coffee cupping competition with the aim to improve the number of villages capable of reaching the export specialty coffee market. Additionally, by creating prizes for mixed arabicas and robustas, all parties were striving to see what the potential of the plateau might be. Most importantly, to be eligible to win the cup competition, all farmer receipts were required so that traceability and transparency were not lost. In future years, a portion of the 10% reserved for the cooperative development fund will continue to be allocated to maintain the cupping competition. As the former SCA President, Paul Katzeff told us, “Not every village wants to be the best but no village wants to be the worst.” In the case of the JCFC, this has been proven time and time again. So with that in mind, friendly competition keeps everyone motivated to continue improving year after year. On June 24th, 2017, 150 JCFC members came together at Phou Oy village for the annual celebration party, pot-luck and award ceremony! These are photos from that event and a few photos leading up to the end of the season event. 4. A minimum of one village chief or member must participate in all JCFC trainings & meeting. 5. 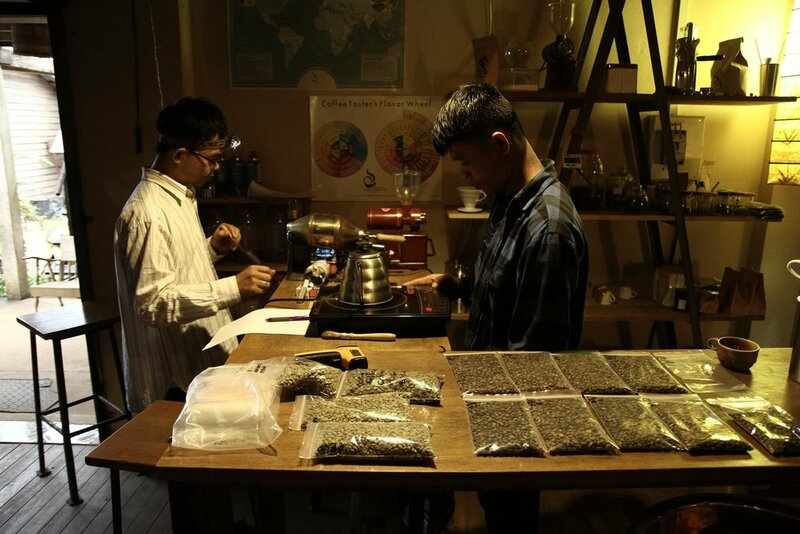 Jhai will collect samples, which means we will collect a small amount of parchment from every single bag to send to America and also cup at the cafe. 6. Independent cup scores from at least three international professional quality graders will be used to determine the winners. 7. Participation in Jhai Coffee House cupping session is required. 8. Winners will be announced, awarded and paid at the end of the year celebration party. 1. 200 kilos of parchment minimum. 2. The highest cup score of mixed Arabica will be declared the winner and samples will be sent to US buyers for consideration for purchase. 2. The highest cup score of Robusta will be declared the winner and samples will be sent to the US buyers for consideration for purchase. 1. All coffees 84+ points will be considered. 2. The largest lot size in kilograms will be the winner. *So, an 84 point coffee with 2 tons will win over an 87 point coffee with only 250kg. 1. Coffee entered does not have matching Farmer/Village Chief receipts. 2. All coffee must be accounted for via receipt system or you cannot win. No exceptions. 5. If any member denies helping any other member when asked for help the person who denies help is disqualified. If the individual cannot help, they must pass that individual in need to someone who can provide assistance. Click to watch the truck loaded with JCFC coffee pull away from the warehouse!